The 2019 CSRS retiree COLA is based on the third quarter (July, August, September) average CPI-W index (1982-84=100) in 2018 over the 2017 third quarter average. The 2019 CSRS COLA adjustment will be 2.8% effective with January 2019 annuity payments. The 2019 FERS retiree COLA is based on the third quarter (July, August, September) average CPI-W index (1982-84=100) in 2018 over the 2017 third quarter average. However, if the CPI-W quarterly average increases 3% or more, they subtract 1%. A 5% increase in the quarterly CPI-W average results in a 4% adjustment. If the quarterly average increases from 2% to 3%, benefits increase by 2%. A CPI-W quarterly average increase of 2% or less will increase benefits by the change in the CPI-W quarterly average. The 2019 FERS COLA adjustment will be 2.0% effective with January 2019 annuity payments. The 2019 Social Security COLA is based on the third quarter (July, August, September) average CPI-W index (1982-84=100) in 2018 over the 2017 third quarter average. The 2019 Social Security COLA will be 2.8% effective with January 2019 annuity payments. Many CSRS annuitants worked other jobs, second jobs and sometimes third jobs in order to increase their Social Security benefits. We worked and contributed to the Social Security system at the same percentage as other non-CSRS employees who contributed to Social Security yet we are denied an equitable benefit for those contributions. “For most Americans, Social Security is essential for retirement. Just over 3 in 5 seniors rely on Social Security benefits for most of their income. “Social Security’s revenue was about $957 billion in 2016 – 87 percent of which was from workers’ and employers’ contributions on wages up to $127,200 a year. “Social Security’s benefits are modest, but vital, averaging around $15,000 per year. “Social Security lifts 22.1 million Americans out of poverty. Without it, the poverty rate of our seniors would be nearly 41 percent; instead, it is just under 9 percent. “Social Security can never go bankrupt. Nearly all of its income, 97 percent, comes from the contributions of workers and employers, or interest on these contributions. We must continue to use our voices to let to Congress know we expect them to be committed to protecting our hard-earned benefits – our federal pension (CSRS or FERS [Federal Employees Retirement System]), Social Security, Medicare, health insurance and life insurance. We also expect them to protect and preserve the public Postal Service. Continue to write letters or postcards and call Capitol Hill at 1-202-224-3121, or use the APWU line 1-844-402-1001, to speak to your member of Congress. Remind them that these are our paramount issues as postal retirees, senior citizens and postal workers. The 2019 cost-of-living adjustment (COLA) to Civil Service Retirement System (CSRS) annuitants and Social Security benefits will be 2.8 percent. The 2019 COLA for those covered in the Federal Employees Retirement System (FERS) will be 2 percent. As we enter the season of gratitude and giving thanks I want to first thank all of all our Veterans and all of our active military personnel for their service. We also give thanks and share our blessings in other ways. Retirees can now make contributions to the Combined Federal Campaign (CFC) using their annuity, credit card, or ACH from their bank account. Consider contributing to the Postal Employee Relief Fund (PERF) using Code 10268. Visit the CFC Donor Pledge System at https://cfcgiving.opm.gov/welcome for more information or to obtain forms and mail then directly to the CFC Processing Center address listed on the form, postmarked, no later than January 11, 2019. Direct your questions to CFC Customer Support at 800-797-0098. 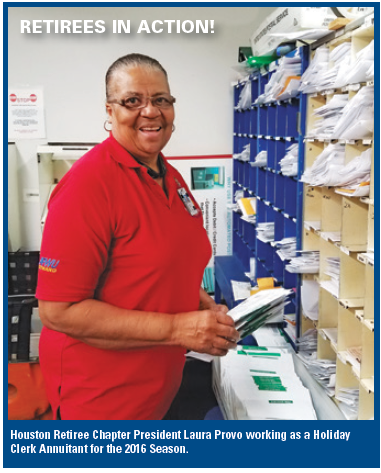 As the President of the only retiree chapter chartered by the American Postal Workers Union (APWU) in the great state of Colorado, there is a requirement to work closely with the Denver Metro Area Local (DMAL) of the APWU. That includes the officers and executive board (EB). Without the local’s support there would be NO Retiree Chapter. Our membership is grateful for the support we have received over the past years. With the local’s support we continously struggle against the RepubliCon’s who intend to take everything from us and give it to the economic royalists. For example, most recently a tax scam was passed that will add at least $1.5 TRILLION to the US debt that has now surpassed $21,000,000,000,000! Debt and deficits just don’t matter under the dark side’s administration thereof. But wait, there’s more…. They are now planning how to cut Social Security, FERS, CSRS and Medicare benefits because predicitibly, the debt is now soaring. Doesn’t matter to them that none of these programs are on budget or causing a single penny of the deficit spending because we prepaid our benefits over decades of work out of every single pay check. Thus why, for example, the social security trust fund has about $3 Trillion in surplus funds by purchasing the most sought after investment vehicle in the world, USA Treasury Bonds. The Chapter also struggles on a daily basis to get a voice and a vote in the local’s deliberations and at the National Convention. Under the national constitution and bylaws, Retirees get five, count them, five delegates to the National Convention out of thousands who attend. The APWU and local constitutions only allow our retirees to have a voice and/or vote if such retiree pays a years worth of FULL dues, amounting to a nearly $700 annual poll tax, on any retitree wanting full involvement with their democratic union. The Chapter has tried on a few occasions to change the local constitution to allow one or two retirees to attend the National Convention, with voice and vote at NO expense to the DMAL membership. We proposed sending a couple of the 75 delegates the local is entitled to from the Retiree Chapter with the Chapter Treasury picking up the tab for the travel, lodging, etc. When that proposal hit the floor with a thud at an Executive Board Meeting, we attended to present our proposed changes, we adapted and our membership authorized us to offer up: 1. that we would pick up the tab for the expenses and 2. pay a full year of DMAL dues for each delegate certified for the national convention. That proposal was also unceremoniously shot down by the DMAL Executive Board because the local constitution while giving the Executive Board full authority to place the proposed change before the DMAL membership, also provides for a petitioning process to get the proposal before the members. Our Executive Board preferred the Chapter follow those constitutional provisions. That decision requires the Chapter to get five full dues paying members of the DMAL to sign the latest proposed changes for submission to the DMAL Constitution Committee, no later than August 12, 2018. We are currently working on getting a voice and vote for a single (or two) Retiree Chapter members via a change to the DMAL Constitution and Bylaws. If you are asked to sign the proposed change, please help us in our struggle for participation in the DMAL democratic process. Another example of our struggles with our great DMAL/APWU concerns freedom of the press, aka Mountaineer. One of our Chapter Brothers, Garland Lewis, is a published author! His request to pay the DMAL funds to advertise his book in the Mountaineer was outright rejected by the DMAL Executive Board. I find it understandable that the Executive Board would try to censor his book since it has a couple sentences in the entire volume of criticism about DMAL and one of its current Executive Board Officers. However, our DMAL is a democratic organization built upon a foundation of transparency and freedom of expression, at EVERY level. In fact, every member of DMAL is covered by a Bill of Rights, of which, number five says, “Every member has a right to freedom of the press”. But wait you say, Brother Lewis is not technically a member of the DMAL because he doesn’t or has not paid the full year of dues. Well, there you go, a perfect example of the DMAL retiree’s struggle for access to not only the DMAL democratic processes, but also something as fundamental as the Bill of Rights! It would also be easy to argue that an advertisement in the Mountaineer is NOT part of a member’s unambiguous and unadulterated right to freedom of the press. So be it, if so, yet shouldn’t we all strive for the complete inclusion of our retirees who have paid tens of thousands of dollars in dues over the course of their working careers? Many would answer no, while some say yes. That is what promulgates the struggle, the democratic process itself! However, hear this, it will not be long, as in just a few years down the road, that retiree’s will outnumber actual working APWU members. If the full dues paying membership continues their seemingly anti retiree conduct at that point, I will be the first to scream from the rooftops, a minority group is calling all the shots in our allegedly democratic institution or in other words, “Apartheid”. Last December, under a new rule proposed by the Trump Department of Labor, restaurants can take servers' tips and "pool" them in order to disperse some to dishwashers, bussers, etc. : but it does not actually require them to do so, and, instead, allows employers to pocket some or all of the wait-staff's tips. On Dec. 15, 2017, the Trump National labor Relations Board (NLRB) announced in PCC Structurals Inc. that it would expressly overrule its own precedent form their 2011 decision in Specialty Healthcare & Rehabilitation Center of Mobile. In Specialty Healthcare, the NLRB had replaced these factors and created a presumption that favored the unit description submitted by the union absent an “overwhelming community of interest” with other excluded employees. One day earlier, in Hy-Brand Industrial Contractors Ltd., the Trump NLRB overruled its 2015 Browning-Ferris decision on joint employer status and returned to the joint employer standard the NLRB applied for decades prior to that decision. In Bowning-Ferris, the Obama NLRB had made it easier for unions to bargain with joint employers regarding hiring, firing, discipline, supervision, and direction. On Dec. 14, 2017, the Trump NLRB discarded the Lutheran Heritage Village-Livonia standard for determining whether facially neutral work rules might violate the National Labor Relations Act if “employees would reasonably construe the language to prohibit Section 7 activity.” These three changes drastically hurt workers and especially UNION workers. From the perspective of a person who loves freedom, equality and the American Way the insane administration has entered in all-out war against such values. Revocation of Federal Contracting Executive Orders in March of 2017 to allow discrimination against employees based on sexual orientation or identity, The nomination of Mick Mulvaney to both the Office of Personnel Management (OPM) and the Consumer Financial Protection Bureau (CFPB) is a disaster. His first act at CFPB was to kill the rule that would have required your retirement planner to work in your best interests instead of theirs! In addition, his second act was to request ZERO dollars for the CFPB budget wiping out protections from the vulture banksters for workers and retirees. OPM now takes twice as long to process requests from APWU members and retirees. This list goes on and on but I would be remiss leaving out the latest, greatest RepubliCon tax scam. Yes, Union Workers and many APWU retirees WILL see a modest tax cut at least temporarily. For example, the single largest expenditure for retirees is sickness care what with lifesaving m3dications alone inflating 5000% in many cases. On schedule A, itemized deductions, they can now deduct those out of pocket expenses above 7.5% of their AGI or line 38 of Internal Revenue Service (IRS) form 1040 for the next two years and then that goes UP TO 10% until completely phased out by 2027. All of you getting the pittance of tax relief will see your tax cut expire completely by 2027 and most of you will have any cut consumed by your contractual COLA pay increases within a few years. Meantime, one set of brothers, David and Charles Koch will see an annual tax cut of around $1,200,000,000! The dire consequences of such con jobs is that negotiations will be much more challenging for APWU and now the RepubliCON’s are planning cuts to Medicare and Social Security (Pre-paid out of every pay check for decades) after they demolish the PPACA and Medicaid. Many APWU members are able to get Medicaid to pay for their parents or grandparents stays in assisted living homes, as do some of our current retirees. Either these elderly will be thrown out into the street or the costs to stay in the facility will explode when Medicaid doesn’t pick up over half the tab as they do now. Meantime, for those of you duped by the “deficit” and debt” scams it is no surprise that the Republicon’s usually double or triple the debt when they control power while screaming about it when democratic party members control the power. For anyone interested in the facts do a search on Jude Wanniski and the “Two Santa Claus” scam the RepubliCON’s have been peddling since Ronnie Raygun took office. This administration and the 115th Congress have manufactured over a trillion more dollars in deficits with the tax scam and another trillion dollars to manufacturer MORE THERMO-NUCLEAR warheads! My writings have continuously focused on the fact that elections have consequences. Please avoid being part of the 100,000,000 American’s who felt their vote didn’t count in 2016 and plan on voting November 6th for candidates that support you, your family, your Union, USPS and retirees. Thanks! Local and state organizations need to look to our retirees as a vital part of our union. They should share resources with retirees and encourage more chapters to be formed. Retirees are our family and are our activist backbone, who fought to preserve the worker protections we have today. We are all in this battle together. Today’s retirees helped build the American Postal Workers Union. During the 1970s and 1980s, they were staunch defenders of the union, many taking part in the Great Postal Strike of 1970. Thousands served as both negotiators and stewards, representing workers on the job and securing the benefits we have today. As young postal workers, our retirees were not willing to be fired at will, segregated by color, or denied safety and health provisions, wage increases and collective bargaining rights. As young workers, many fought in the Vietnam War, marched for the equal rights amendment, supported better worker protections and became active in their unions. Gains become a reality when workers participate. Today, we see a government that is actively cutting workers’ rights with a vengeance. Those brave young workers, who are now retirees, are also affected by the proposed cuts, especially to health care and retirement benefits. There is a place in every local for retirees. They are great mentors and can help provide training and give valuable advice to workers. There are many local officers who are retired or will be retiring soon, and they would like to see new workers step up into union leadership positions. Retirees can also help with the contract campaign and anti-consolidation activities, as well as build relationships with elected officials. They can reach other organizations that can become part of A Grand Alliance to Save Our Public Postal Service. One of the primary reasons the Stop Staples campaign was so successful was because of the countless hours worked by dedicated retirees across the country. Only when we stand and act together in solidarity, can we grow. We must fight to keep the Postal Service vibrant and serving our community with equal access to affordable, prompt, postal services. We must protect our rights as workers. We are at a serious place in history and every member must get involved now. We cannot win this battle without large numbers of people acting together. Let’s make 2018 the year that all postal workers, retirees and our communities come together, Fighting Today for a Better Tomorrow. It all started with a fantastic catered dinner sponsored by the Denver Metro Area Local of the American Postal Workers Union (DMAL,APWU). The elected Director of Human Resources at the time, Phil Desautels, did much of the work behind the scenes with support from the DMAL President, John Ancona and the Executive Board. Everyone joining in on the festivities that evening were interested in establishing a Retiree Chapter chartered by APWU. A chairperson was nominated and elected at the dinner to start the certification and application process for a DMAL Retiree Chapter. You too can form a retiree chapter. The first step is a several page instruction sheet from the APWU Director of the Retirees. A constitution and bylaws for your chapter must be written up and presented to a meeting of retirees paying the $36 a year, for ratification. The APWU “rebates” about 40% of your $3 each month to the chartered chapter. Do the math and see that there are funds to do informational mailings and to send delegates to retiree conferences. Your leadership likely will receive no compensation, as all work with every chapter on APWU’s books is voluntary. Under the APWU national constitution, the chapter’s mission is political action to contact and vote for local, state and federal representatives who share your concerns as retirees in America. To help those who support our pensions, our social security, our Medicare and other health care access, our environment and our cost of living increases. You can band together to admonish those who would make your lives harder and more uncomfortable that retirees are a force and are engaged in the political process. After all, it is only through working together in an organized fashion that we have any chance of the golden years we worked for, prepaid and deserve. The forces of darkness are constantly looking for ways to take from us so that they can have even more. The good news is that there are hundreds and hundreds of millions of us and only a few hundred of them. Of course, also in the good news category is that active retirees can move mountains in the political arena. Meantime, until you decide to and work towards forming your own APWU chartered retiree chapter, ANY retired APWU member in Colorado paying the three bucks a month or $36 annually can join the Denver Metro Retiree Chapter (DMRC). Up here in Leadville, my neighbor across the street who worked at the Vail Post Office is a full member of the DMRC. Simply by providing your CSA# to the office manager at the Denver Metro Area Local (DMAL) of the APWU you can enroll as a retiree member! If you retired from a different local that has no chapter yet, simply write a letter to Nancy Olumekor, APWU Retirees Director, stating you wish to be designated as a DMRC member and you can join us in our work to save our benefits and pay. We also need your help to repeal legislation like the Windfall Elimination Provision that robs some of our members of their full social security benefits. All of us at the DMRC look forward to your membership, help and activity. Our struggle continues every day so we really need you on board. If you are a Federal Employee Retirement System employee, by putting just five percent of your income into your TSP, the Postal Service will match the amount you contribute with an additional five percent. That means you’ll have twice as much going into your TSP as you originally contributed. Plus, you could benefit from lower taxes on your current income. Can’t afford five percent? Every dollar makes a difference. Investing in the TSP is easy. It is made up of five core funds that you can mix and match. Or, if you aren’t sure which funds to choose, you can invest in a Lifecycle fund that is professionally designed based on when you’ll need your money. An employee earning $50,000 per year who contributes five percent to their TSP – about $95 per paycheck – and earns an average annual rate of return of six percent, can potentially have a TSP account worth nearly $420,000 after 30 years. Time is your biggest ally when it comes to the growth of your TSP account, so starting early and saving consistently can make a tremendous difference. If you need to, go smaller and deposit $20 a week, which is only approximately $1,000 out of your paycheck each year. You can make or change TSP contributions at any time. For more information on TSP and your investment options, visit https://liteblue.usps.gov/tsp. Consistent and early savings can be the difference between a comfortable retirement and a difficult one. It is never too early or too late to save. Retirement Annuity Calculation Use one of the worksheets below to develop an estimation of your retirement annuity.